The Benchmark H2200-H MyTemp Mini Incubator is a reliable, temperature controlled system which can conveniently be taken on the road if needed. These easy to use incubators include micro processing controls allowing the user to set the desired temperature and walk away. The incubator heats up immediately and only takes a few minutes to reach the temperature setpoint. 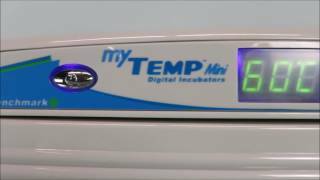 The Mytemp Mini Incubator comes with built-in thermometer and LED control panel, which displays the real-time temperature. These portable incubators include a UV Lamp housed inside the chamber for germicidal use. The internal chamber of this portable incubator is capable of holding 12 liters of bottles and flasks, as well as a lab shaker, or lab rotator. System plugs directly into a standard 115V outlet and comes with an 9V travel plugs to take your incubator on the road with you. This Benchmark H2200-H MyTemp Mini Incubator is ideal for transporting samples from one location to another. We have several of these units in stock including brand new ones. Contact us today to learn more about our Benchmark MyTemp Mini Incubator. The Benchmark H2200-H MyTemp Mini is ideal for transporting temperature sensitive samples from one lab to another, without compromising the integrity of the sample. This easy to use incubator is in stock and ships within three days.